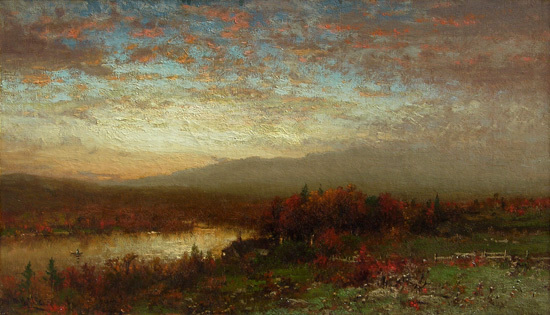 George Herbert McCord is recognized for his ability to accurately reproduce atmospheric qualities in his paintings, especially brilliant sunsets whether it was over water or land. Just as Jervis McEntee was called a painter of twilight, McCord seemed to be drawn to this time of day and to capturing golden sunsets that are offset by darkening foregrounds. He travelled extensively throughout New England, Florida, the Upper Mississippi, Mexico and Canada and was among the select few artists that were invited by the Santa Fe Railroad company to create paintings of the Grand Canyon in Arizona. George Herbert McCord was born in New York City on August 1, 1848. He became a student of Samuel F.B. Morse and James Fairman at the age of eighteen and began exhibiting at the National Academy of Design in 1868. After gaining widespread recognition in 1870 through an exhibition in New York City, George McCord received a commission from Andrew Carnegie to paint the surroundings of his castle in Cluny, Scotland. He became an associate member of the National Academy of Design in 1880. Boats at Twilight is signed A.N.A so it was clearly painted sometime after 1880.